A hygrometer is a device that measures the relative humidity (RH) level which is expressed as a percentage (%). The use of a hygrometer can assist you in maintaining optimal humidity levels in your home. A relative humidity level of 35% to 50% is normally recommended for home air. Our deluxe hygrometer features a wider humidity measurement range than most other brands, as well as a sleek look and design that fits in most room decors! 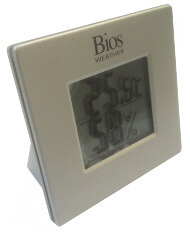 This unit displays current indoor temperature (Fahrenheit and Celsius)and humidity measurements, as well as minimum and maximum temperature and humidity readings. It can be used as a hand-held device or it can sit on a countertop, desk, shelf, mantle, etc. It features large, easy-to-read LCD displays and includes a built-in tabletop stand.